I’m not entirely certain that this wreath is a winner. This might be an example of one of those situations where you try to re-create something you’ve seen only for it to morph into something entirely unexpected. I’ve seen several rosette wreaths over the past few years and it seems like all of them have been made with slightly different techniques and styles. I was feeling pretty confident that I could easily create my own with my own unique spin. But once I hung it on the door, I had to scratch my head and wonder. I had wanted my wreath to have a lot of texture, so I cut the strips with pinking shears, but now I looked at it and thought, Is the texture too busy? I also hadn’t been particularly careful about making the strips even because I thought the variety might be appealing, but now I wondered, Does it just look sloppy? Even though I’m not overly thrilled with this creation, it will hang on our door throughout this season nevertheless. I feel like it says to visitors, “Welcome. Come on in. Relax and be yourself. We don’t expect perfection here!” And you know, I have a feeling that’s a pretty worthwhile sentiment for me to keep in the coming month. 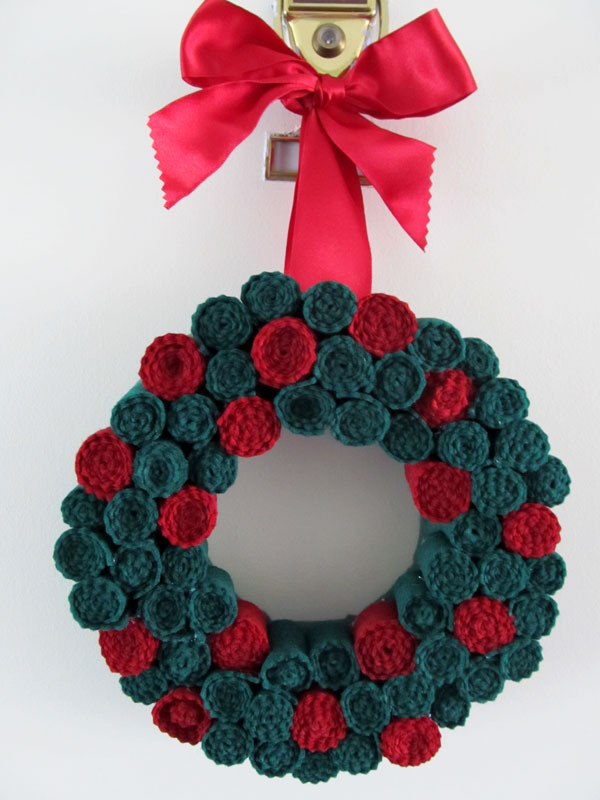 Trace the Styrofoam wreath form onto each 12″ x 18″ piece of green felt. On one piece, cut along both the inner and outer circle lines, set aside. Cut the other piece into a circle that is about 4″ larger than the wreath form, using the outer circle line you traced as a guide. Fold this circle in half and clip a hole in the center. Open the circle back up. Cut eight lines out from the center hole that you clipped to about 1/4″ from the inner circle line. 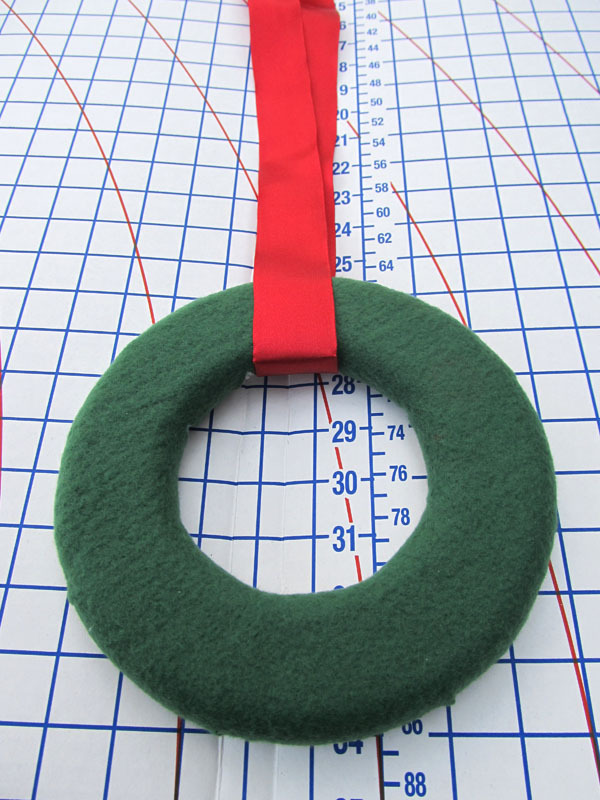 Cut from the outer edge of the green felt to the outer circle line to form eight equal parts on the outside too. Place the Styrofoam wreath form in the center of this circle. Pull up on a triangle of felt from the inner circle and lay it flat on the back of the Styrofoam. Pull up a piece from the outer circle and lay it on top of the triangle piece. Pin through both pieces into the Styrofoam. Repeat all the way around the wreath, making sure that all the Styrofoam on the front and sides is covered. 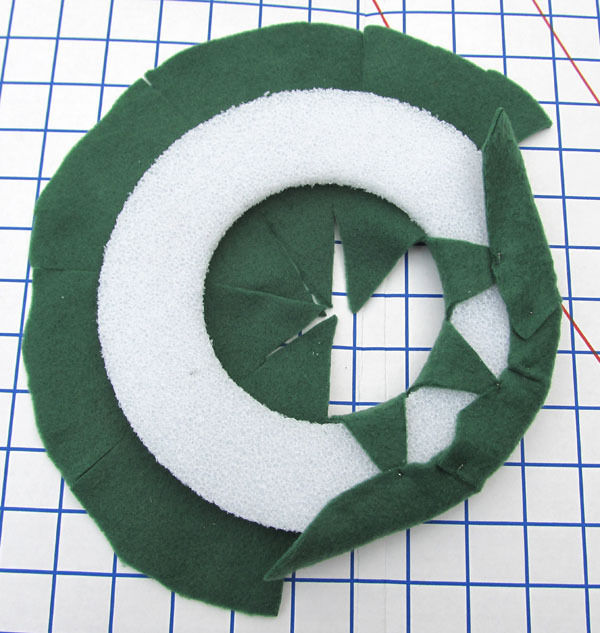 Hot glue the green felt circle with the hole in the center to the back of the wreath form to cover it. Wrap the ribbon around the wreath and hot glue it to the wreath form. Cut the red felt into 1″ strips, alternately using scissors and pinking shears, so that one side of each piece is jagged and one side is straight. You will have 16 strips of red felt. Repeat with the green felt. 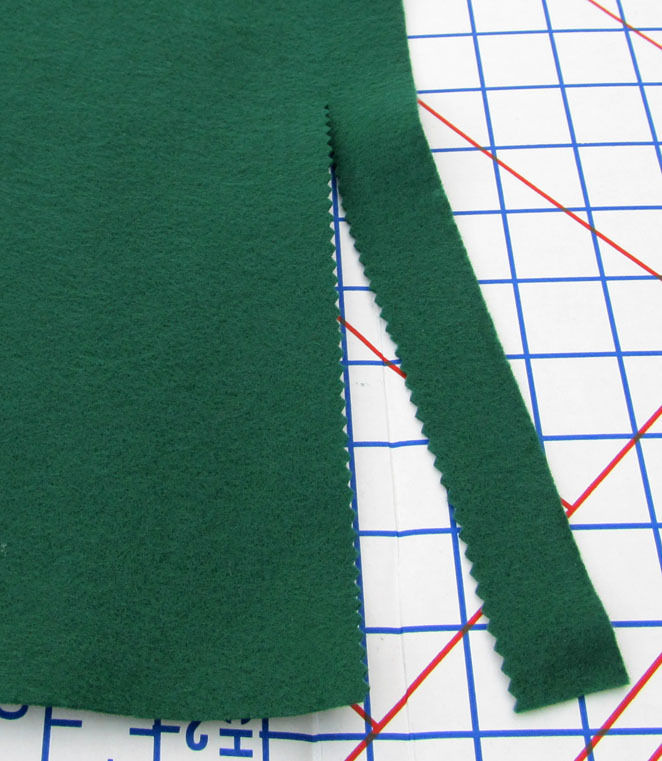 Then take each strip of green felt and cut it in half so that each strip is now 9″ long. You will have 56 strips of green felt. Roll up all the strips of red and green felt and secure each end with tacky glue. Attach the flat side of each rosette to the wreath form using the hot glue, alternating placement of red and green rosettes. Depending on how tight you make them, you may end up with a few leftover rosettes. Hang wreath from your door knocker or wreath holder by tying the ribbon in a bow. Finish the bow’s ends with the pinking shears. 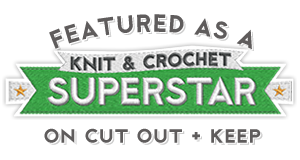 Categories: Make It | Tags: Christmas, crafting, crafts, diy, home, hot glue, mini felt rosette wreath, pinking shears, satin ribbon, Styrofoam, tacky glue | Permalink.